*Sandcastle Stamper* : RSG: My flowery friends in the springtime! It's springtime on my blog today! every third Wednesday of month. It's wildly creative and always tons of fun! which I loved so much! asked each other 3 questions and created our card based on the reply. 1. What is your favorite season? Spring! 2. What is the first word that comes to mind when I say the word fun? Friends! 3. What is your favorite embellishment to use on cards? Ribbon! Such a sweet theme, Barb! You made this month's card easy! by American Crafts and I've created little hills with it. Finally, the ribbon was tucked behind the trio as green grass. I stamped a sentiment onto the cardstock from another stamp set. it was a lot of fun to create this card with YOU in mind! I'm up for next month ~ and need to put my thinking cap back on! 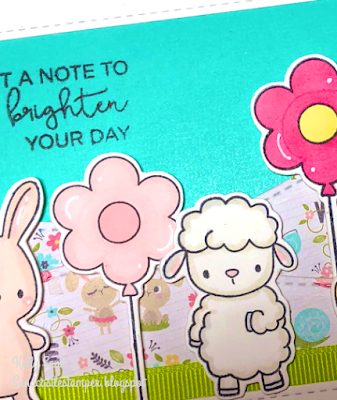 Kelly, you captured Barb's answers perfectly on this ADORABLE card! Such cute images and fun design! Love it!!! So cute and fun! Love your card Kelly. What a cute card! The sentiment makes me think how I really need to get out some "just because" cards. THis is absolutely adorable with those cute characters and big flowers! Love it! These little characters are so adorable and you've colored them just perfectly. The pretty little spring rolling hills are so fun! Loving the frame and the ribbon grass too! So cute! Great job with your challenge! Kelly--I love your card. These are such cuties and I really like how you used the ribbon. Sweet Friends! So cute and what an awesome way to get inspiration! I love this sweet trio and their fun balloon flowers!! Such a precious card, Kelly!! How fun and sweet too! I love the fun animal Fiends with their feet in the soft green Grass on a lovely Spring day!